Price Chopper: FREE Suave Professionals & $0.33 Crest Mouthwash, Toothpaste or Toothbrush W/ Printable Health &amp; Beauty Dollar Doubler! Price Chopper: FREE Suave Professionals & $0.33 Crest Mouthwash, Toothpaste or Toothbrush W/ Printable Health & Beauty Dollar Doubler! 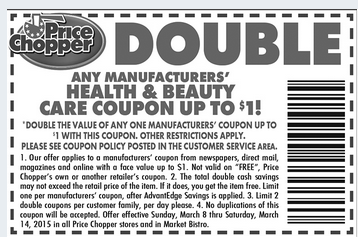 Price Chopper has released a printable dollar doubler for Health & Beauty items! (this has the Dollar General logo on it but is a manu. coupon so can be used anywhere) + Dollar Doubler = FREE! Deal: use any (3) $1/1 above + use 2 Health & Beauty Dollar Doublers above (limit 2 per day) + in ad bonus coupon = $0.33 each!